When searching for causes of Earth’s mass extinctions, scientists instinctively turn to geophysical calamities: erupting volcanoes, methane bursts, asteroid strikes and other obvious dooms. But in the most massive extinction of all, when most of everything that lived died out some 250 million years ago, a more subtle form of destruction has been suggested. Following an initial volcanic upset, the loss of life itself may have fueled further extinctions, then slowed life’s recovery. That possibility, suggested by massive analyses of fossils and chemical signals left during the Permian-Triassic extinction event, represents more than an interesting wrinkle to a notable period in history. By this reading of the fossil record, biological diversity — something that’s now imperiled by human appetites — may be a sustaining, stabilizing force on planetary scales, and its disruption self-perpetuating. Whiteside’s specialty is mass extinctions and their geophysical consequences, cycles of energy and nutrients that play out over millions of years. Her latest study, co-authored with University of Utah paleobiologist Randall Irmis and published Oct. 26 in Proceedings of the Royal Society B, follows on earlier findings that the taxonomic richness of ammonoids, a once-dominant class of marine invertebrates, rose and fell with in tandem with fluctuations in Earth’s carbon cycle for 10 million years after the Permian-Triassic extinction. During that time, the carbon cycle — the flow of life’s essential element through all Earth’s systems — oscillated wildly, a period known as a “chaotic carbon interval.” And rather than rebounding and steadily filling suddenly open niches, as might be expected, life appears to have entered a boom-and-bust cycle. Species flourished and collapsed, over and over, a planet-level version of the jellyfish bloom-and-bust cycles now seen in overfished oceans. Applied to mass extinctions, this idea is somewhat radical — but in a coral reef or rainforest, or even a computer network, it’s an accepted notion. Just as distributed systems are more secure than a handful of mainframes, ecosystems composed of many interlocking and sometimes redundant species are especially sturdy. Because they’re stable, they in turn nourish life’s diversification over evolutionary time. It’s a biological catch-22: A richness of life requires stability to develop, but stability requires a richness of life. Through this lens, “chaotic carbon intervals record the instability of the ecosystem itself,” wrote Whiteside and Irmis. It doesn’t simply reflect the lingering aftereffects of the Permian-Triassic extinction’s initial causes, but life’s new post-extinction rules. Whiteside’s earlier study joined marine fossil records with carbon analyses taken from ancient seafloor sediments. The new study ventures onto land: Irmis painstakingly classified some 8,600 terrestrial vertebrate fossils collected in southern Africa and the Ural region of Russia, spanning the period from 260 to 240 million years ago. Carbon records came from several studies of Permian-Triassic sediments. When Whiteside joined the terrestrial fossil record to carbon cycling, the same basic patterns emerged as she’d seen at sea. Over several million years, roughly 80 percent of all terrestrial animal species vanished. A few tough groups — so-called “disaster taxa,” such as a German shepherd-sized lizard called Lystrosaurus, pictured above — survived and prevailed in post-extinction ecosystems, which were dramatically simplified compared to what existed before. 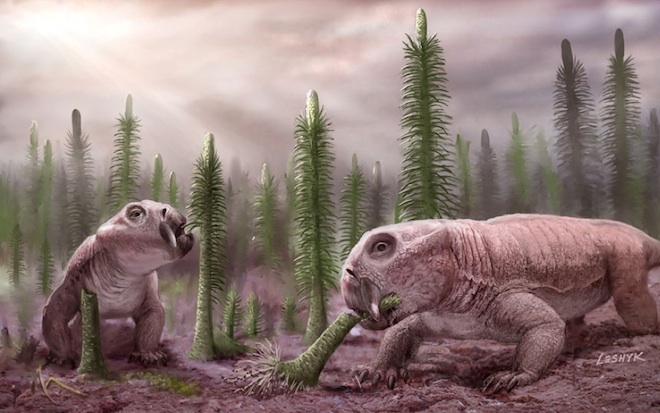 Whiteside and Irmis plan to conduct similar studies of other mass extinctions. If reduced biological diversity really did make it harder for life to rebound, then the most pressing questions aren’t historical, but immediate. Scientists say that Earth may now be entering another period of mass extinction, with species dying at a pace seen only five times in life’s history, including the Permian-Triassic. Exactly how current extinction rates compare to those episodes is an open question, all the more pressing if modern extinctions represent not just the loss of a lineage but a constraint on evolution for the foreseeable future, if not millions of years to come. According to Roopnarine and Angielczyk, their analyses differ subtly from Whiteside’s in more precisely tracing post-extinction instabilities to losses of specific animal groups, especially large predators and herbivores. Those equilibrium-maintaining animals are the ones now dying off fastest. Species that survive are often so rare as to be, in ecological parlance, functionally extinct. 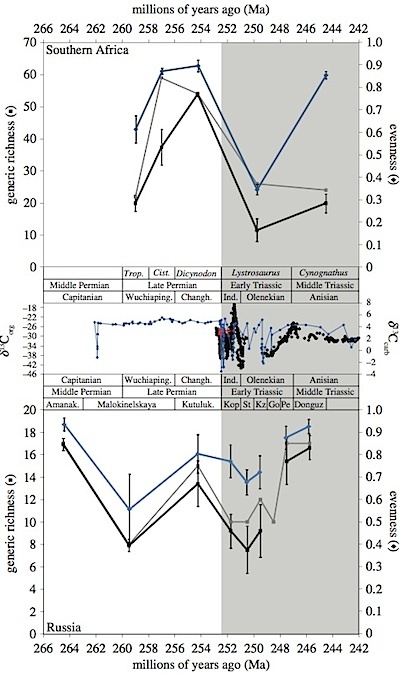 Citation: “Delayed recovery of non-marine tetrapods after the end-Permian mass extinction tracks global carbon cycle.” By Randall B. Irmis and Jessica H. Whiteside. Proceedings of the Royal Society B, Vol. 278 No. 1723, Oct. 26, 2011.